The high loading of air pollutants in heavy traffic area has urged researcher to pay greater attention as it frequently associated with significant health impact particularly among children. This study aims to determine the association between traffic-related air pollutants and respiratory health among Malay primary school children in heavy traffic area and low traffic area. A cross-sectional comparative study was carried out among Malay children in heavy traffic area (N=69, Kajang) and low traffic area (N=69, Hulu Langat) areas. Air quality monitoring was conducted in 6 primary schools which include parameters of PM10, PM2.5, ultrafine particles (UFP), nitrogen dioxide (NO2), sulphur dioxide (SO2), carbon monoxide (CO) and carbon dioxide (CO2). A set of standardized questionnaire was distributed to obtain respondents’ background information, exposure history and respiratory health symptoms. Spirometry test was carried out to determine the lung function of the respondents. Traffic count survey was conducted at two time intervals per day (7.00-7.30 am and 1.00-1.30 pm). The result showed that there is a significant difference between concentration of PM10 [t=22.37; p≤0.001], PM2.5 [t=9.73; p≤0.001], UFP [Z=-3.36; p=0.001], NO2 [t=5.73; p=0.001], SO2 [t=6.88; p≤0.001] and CO2 [t=15.67; p≤0.001] in school in exposed and comparative area. Lung function abnormalities found in children in exposed area was 3 times higher than comparative area. All respiratory symptoms show significant difference between both exposed and comparative groups. All pollutants show a significant association with lung function abnormality among the respondents. The finding indicated that higher PM10 and PM2.5 will increase the FVC abnormality by 4 and 6 times of getting FVC abnormality and increase the FVC abnormality by 2 and 3 times of getting FEV1 abnormality. The finding concluded that exposures to traffic-related air pollutants, especially PM10, PM2.5 increase the risk of getting lung function abnormality and respiratory health symptoms among respondents. Over the past decades, transportation becomes one of the most crucial parts in human life. The increased urbanisation and urban population have increased in dependence on motor vehicles. Ministry of Transport Malaysia (2017) reported that there was a dramatic increase on the number of inland transportation in 2015 especially in urban and developing area. The increasing number of vehicles in traffic road in urban area will lead to traffic-related air pollution due to emission of air pollutants from the vehicles as generated by gasoline-powered cars, diesel-fuelled buses and lorries. Besides, the burning of fossil fuels creates primary pollutants such as carbon dioxide, carbon monoxide, nitrogen oxides, sulphur oxides, hydrocarbons and particulate matters (Finkelstein et al., 2004). The increment traffic-related air pollutants in urban area had raised public concern especially the health consequences of traffic exposure among susceptible population. Exposure to traffic pollution is a public health concern particularly in children, who are one of the most susceptible groups of the population. Exposure to highly polluted environment during childhood can alter development of lung and affect pulmonary function in children (Silva et al., 2015). Children are more vulnerable to air pollutants by virtue of their increased susceptibility and the higher doses received (Mielzynska-Svach et al., 2013). Children are more vulnerable than adults to environmental risks as they breathe higher volume of air, their body systems are still developing and they have little control over their environment (Salvi, 2007). Besides, children’s lungs are still growing and they breathe differently from adults. A study by Ierodiakonou et al. (2016) reported the increases in the average long-term concentrations of ozone, CO, and NO2 were all associated with reductions in lung function consistent with airflow obstruction and with some decreased in vital capacity represented by a decrease in forced vital capacity (FVC). Particulate matters such as PM10 and PM2.5 contain microscopic solid or small liquid droplets that can be inhaled and cause serious health problems. Previous local study in Selangor has reported high level of urban PM10 is associated with the reduction of lung function of preschool children as well as increased respiratory symptoms (Yahaya and Jalaludin, 2014). This study is supported by Rawi et al. (2014) revealed that exposures to PM10 is associated with wheezing. Furthermore, 24.4% and 19% of urban children are having wheezing and chest tightness respectively when exposed to PM10 (Choo et al., 2015). A study conducted in New York City showed that short exposure of PM2.5 have been associated with reduction of lung function among urban children (Jung et al., 2017). NO2 gas is primarily emitted in the air from the burning of fuels and also forms from emission from cars, lorries and buses, power plants and off-road equipment. The acute effects of NO2 are respiratory airway inflammation and respiratory symptoms such as coughing, wheezing or difficulty in breathing. A study from Ierodiakonou et al. (2016) showed the increases in the average long-term (4-month) concentrations of NO2 was all associated with reductions in lung function consistent with airflow obstruction and with some decrease in vital capacity represented by a decrease in FVC. The greatest sources of CO to outdoor air are cars, lorries and other vehicles or machinery that burn fossil fuels. This gas can cause dizziness, confusion, unconsciousness and death at very high levels in indoor or other enclosed environments. Previous study by Rawi et al. (2014) demonstrated that exposure of CO among children showed a significant association with wheezing. This study is supported by Anis et al. (2015) reported children that exposed to high concentration of CO are 3 times more likely to get cough, 2 times more like to get chest tightness. 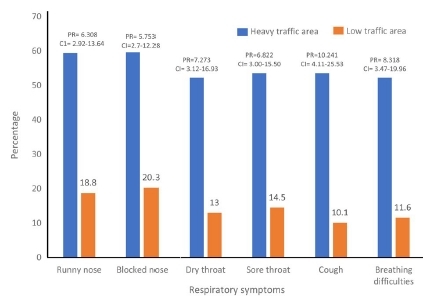 To date, there is relatively scarce evidence on epidemiological studies on lung function and respiratory symptoms among children in heavy traffic area in Malaysia. Therefore, this study is carried out with the aim to determine the association between traffic-related air pollutants and respiratory health among Malay primary school children in Kajang which included as one of heavy traffic areas by Road Traffic Volume Malaysia (2014). The finding from this study is relevant to public health as it focuses on association between traffic-related air pollutants with children’s lung condition and can be useful for improving the environment setting in Malaysian primary schools. This study is a cross-sectional comparative study conducted among primary school children in heavy traffic area (exposed group) and low traffic area (comparative group) in Kajang and Hulu Langat, Malaysia. 138 primary school children aged 9-11 years old from primary school children in Kajang (exposed area) and Hulu Langat (comparative area) were included in this study. Only Malay primary school children were included in this study to homogenize the sample and avoid genetic factor as a confounding factor. The students were recruited as respondent upon parents’ approval and after taking consideration of several inclusive criteria such as 9-11 years old, Malays and free from any respiratory illnesses. Measurement of PM10, PM2.5, UFP, NO2, SO2, CO, CO2 were taken at 1 meter above the floor to represent the breathing zone of the primary school children and also more than 1 meter away from the wall, door and any active heating system. The sampling was taken for 6 hours of school’s hour which is from 7.00 am until 1.00 pm. The air quality monitoring instruments used in this study including DustTrakTM DRX Aerosol Monitor 8534 for PM2.5 and PM10, TSI’s-P-Trak® Ultrafine Particle Counter (UPC) 8525 for UFP, LaMotte’s Model BD Air Sampling Pump TSI for NO2 and SO2, Q-TrakTM Indoor Air Quality Monitor 7575 for CO, CO2, temperature and relative humidity and TSI VelocicalC Plus Model 8386 for air velocity. The traffic count survey was conducted at two time intervals per day which are from 7.00 am to 7.30 am and from 1.00 pm to 1.30 pm when school children arrive at and leave school. The type of vehicles was classified according the size of vehicles which are small size vehicle (motorcycle), medium size vehicle (drive vehicles) and large size vehicles (buses and trucks). This method was adapted from previous studies conducted by Lee et al. (2015) and Cavalcante et al. (2017). This study used validated questionnaire based on two standardised questionnaires which are questionnaire set by the American Thoracic Society (ATS) and International Study of Asthma and Allergies in Childhood (ISAAC) study. The questionnaire was used to obtain information on demographic and socioeconomic background, home environment and also reported respiratory symptoms that filled by parents or guardians. The lung function or spirometry test was conducted by using Chestgraph HI-105 spirometer. Prior to the test, anthropometric measurement was first obtained where the height of respondents was measured by using height scale model “SECA 208 Body Meter” and electronic weighing scale. The weighing scale was placed on a flat surface during measurements. All data were analyzed by using Statistical Package for Social Science (SPSS) Version 22.0. The descriptive test was used to determine mean, median, standard deviation and interquartile range (IQR). Meanwhile, Kolmogorov Smirnov test and skewness were used to determine the normality of the data. Besides that, t-test, Mann-Whitney U test and chi-square test were used to determine the differences and associations between traffic-related air pollutants and respiratory health among respondents. Multiple logistic regression was used to determine the predictors in influencing the lung function impairment among the primary school children. 138 respondents took part in this study with 69 respondents from exposed area, while another 69 respondents from the comparative area. The respondents that living near to main road, which is less 100 meter is higher among respondents living in heavy traffic area compared to the respondents in low traffic area with the percentage of 64.7% (44) and 40.6% (28) respectively. In heavy traffic area, the schools located 500 meter away to the main road meanwhile for low traffic area, the schools located 1000 meter from main road. The traffic count for school in exposed area is higher than comparative area with the number of 464 small size vehicles, 1071 medium size vehicles and 27 large size vehicles in the morning and 335 small size vehicles, 810 medium size vehicles and 11 large size vehicles in the afternoon. The traffic count in comparative area is 17 small size vehicles and 10 medium size vehicles in the morning and 83 small size vehicles, 54 medium size vehicles and 10 large size vehicles in the afternoon. All primary schools in heavy and low traffic are using open ventilation that may contribute to penetration of traffic-related air pollutants into the classroom. Table 1 shows a concentration of TRAP in schools in heavy traffic and low traffic area. Based on the statistical analysis, there is a significant difference between concentration of PM10 [t=22.37; p≤0.001], PM2.5 [t=9.73; p≤0.001], UFP [Z=-3.36; p=0.001], NO2 [t=5.73; p=0.001], SO2 [t=6.88; p≤0.001] and CO2 [t= 15.67; p≤0.001] in primary school in heavy traffic area and comparative area. Concentration of traffic-related air pollutants in schools in heavy traffic and low traffic area. Lung function of primary school children was assessed based on force vital capacity (FVC%) predicted, forced expiration volume in 1 second (FEV1%) predicted and FEV1/FVC% predicted. FVC% predicted and FEV1% predicted were obtained based on the prediction equation for the normal value of lung function parameters among children in Malaysia by Azizi and Henry in 1994. Fig. 1 shows the prevalence of lung function abnormalities among study respondents between two studied area. For FVC% in exposed group, majority of them were having abnormal lung function 44 (89.8%) meanwhile only 5 (7.2%) were having abnormalities of lung function in the comparative group. The result showed that for FEV1% in the exposed group, 47 (68.1%) were having abnormalities of lung function meanwhile only 4 (5.8%) were having abnormalities of lung function in the comparative group. 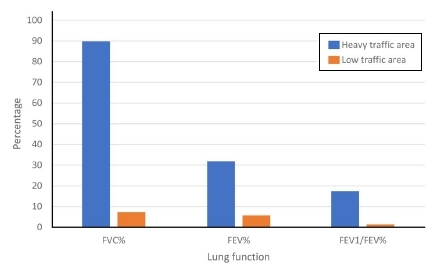 For FEV1/FVC% in the exposed group, 12 (17.4%) were having abnormalities of lung function while only 1 (1.4%) were having abnormalities of lung function in the comparative group. Prevalence of lung function abnormalities among children in heavy and low traffic area. Fig. 2 shows the prevalence of reported respiratory symptoms between the studied and comparative group. All respiratory symptoms showed significant difference between both studied and comparative groups. For runny nose (PR=6.308, 95% CI=2.92-13.64), 41 (59.4%) respondents from heavy traffic area having runny nose with 13 (18.8%) respondents from the low traffic area. It is demonstrated that, the primary school children in heavy traffic area have 6.308 times more likely to experience respiratory symptom of runny nose than primary school children in low traffic area. Besides, blocked nose (PR=5.753, 95% CI=2.70-12.28) have 41 (59.6%) respondents from heavy traffic area having blocked nose with just only 14 (20.3%) respondents from the low traffic area. It is suggested that, the primary school children in heavy traffic area have 5.753 times more likely to experience respiratory symptom of blocked nose than primary school children in low traffic area. Other than that, dry throat (PR=7.27, 95% CI=3.12-16.93) have 36 (52.2%) respondents from heavy traffic area having dry throat with just only 9 (13.0%) respondents from the low traffic area. It showed that, the primary school children in heavy traffic area have 7.273 times more likely to experience respiratory symptom of dry throat than primary school children in low traffic area. For sore throat (PR=6.822, 95% CI=3.00-15.50), 37 (53.6%) respondents from heavy traffic area having sore throat with just only 10 (14.5%) respondents from the low traffic area. The finding revealed that the primary school children in heavy traffic area have 7.273 times more likely to experience respiratory symptom of sore throat than primary school children in low traffic area. For cough (PR=10.241, 95% CI=4.11-25.53), 37 (53.6%) respondents from heavy traffic area having sore throat with just only 7 (10.7%) respondents from the low traffic area. This result indicated that the primary school children in heavy traffic area have 10.241 times more likely to experience respiratory symptom of sore throat than primary school children in low traffic area. Lastly, for breathing difficulties (PR=8.318, 95% CI= 3.47-19.96), 36 (52.2%) respondents from heavy traffic area having sore throat with just only 8 (11.6%) respondents from the low traffic area. It is suggested that, the primary school children in heavy traffic area have 8.318 times more likely to experience respiratory symptom of sore throat than primary school children in low traffic area. Prevalence of respiratory symptoms among children in heavy and low traffic area. Table 2 shows the association between traffic-related air pollutants in schools and lung function (FVC%) among primary school children in both studied and comparative areas. All pollutants were categorized based on their median value of the FVC% and FEV1%. A value FVC% and FEV1% that was higher than median was categorized as high while the FVC% and FEV1% value that was lower than median was categorized as low. Based on Table 2, a significant association was found between all selected pollutants (PM10, PM2.5,UFP, NO2, SO2 and CO2) with FVC% abnormality among the respondents as p≤0.001 (PR=0.134, 95% CI=0.06-0.30), (PR=0.134, 95% CI=0.06-0.30), (PR=0.060, 95% CI=0.02-0.15), (PR=0.049, 95% CI=0.02-0.13), (PR=0.049, 95% CI=0.02-0.13) and (PR=0.055, 95% CI=0.02-0.14) respectively. Table 3 shows the association between traffic-related air pollutants in schools and lung function (FEV1%) among primary school children in both studied and comparative areas. From the result, all selected pollutants (PM10, PM2.5, UFP, NO2, SO2 and CO2) show a significant association with FEV1% abnormality among the respondents as (p=0.013, PR=0.406, 95% CI=0.20-0.83), (p=0.013, PR=0.406, 95% CI=0.20-0.83), (p≤0.001, PR=0.045, 95% CI=0.02-0.12), (p≤0.001, PR=0.042, 95% CI=0.02-0.11), (p≤0.001, PR=0.042, 95% CI=0.02-0.11) and (p≤0.001, PR=0.059, 95% CI=0.02-0.15) respectively. Association of traffic pollutants with lung function abnormality (%FVC pred) among children. Association of traffic pollutants with lung function abnormality (% FEV1 pred) among children. Logistic regression was performed to determine the main factor that influenced the abnormality of FVC% and FEV1% among the primary school children in study areas. Table 4 shows factors influenced the lung function (FVC%) abnormality among respondents. Meanwhile, Table 5 shows factors influenced the lung function (FEV1%) abnormality among respondents. Based on the findings, this study suggested that the higher PM10 and PM2.5 will increase the FVC abnormality by 3.9 and the prevalence rate by 5.5 times of getting FVC abnormality. The higher PM10 and PM2.5 will increase the FEV1 abnormality by 2.0 and the prevalence rate by 3.05 times of getting FEV1 abnormality. Factor influenced the lung function abnormality (FVC% pred) among children. The present study showed a significant difference between concentration of PM10 [t=22.37; p≤0.001], PM2.5 [t=9.73; p≤0.001], UFP [Z=-3.36; p=0.001], NO2 [t=5.73; p=0.001], SO2 [t=6.88; p≤0.001] and CO2 [t=15.67; p≤0.001] in primary school in heavy traffic area and low traffic area. This finding is consistent with study by Fadzil and Jalaludin (2013) which stated the significant difference between the concentration of traffic-related air pollutants in residential near busy road and residential near less busy road. The result might be due to the location of primary school in heavy traffic is near busy road besides the high number of vehicles that contributed badly to high concentration of air pollutants. Based on the traffic count survey, the medium size vehicles recorded the highest number among other type of vehicles. Even though, the medium size vehicles are producing low concentration of traffic-related air pollutants compared to large size vehicle, the high number of small size vehicle will contribute to high emission of traffic-related air pollutants (Zuurbier et al., 2010). Besides, there are a lot of numbers of idling vehicles especially medium size vehicle near to primary school compound in heavy area during afternoon. The present study revealed that primary school children in heavy traffic are having lung function impairment compared to primary school children in low traffic area. This finding is supported by Ierodiakonou et al. (2016) stated that children living near to major roadway is associated with lower FEV1 and accelerated the rate of FEV1 reduction. Another study by Chen et al. (2015) demonstrated that, children that exposed to traffic-related pollutants experienced the reduction of lung function. The present findings was also in agreement with previous local studies that shows the location of the school primarily in urban area or near to the petrochemical industry was significantly contributed to lower lung function among the primary school children (Anis et al., 2015; Choo et al., 2015; Azwani et al., 2014). The most important finding in this study was the prevalence of respiratory symptoms was generally higher among heavy traffic primary school children as compared to low traffic area primary school children. All respiratory symptoms show a significant difference between the studied and comparative groups with cough has the highest prevalence rate. The finding corroborates the results of study by Asrul and Juliana (2017) who found that prevalence of cough is the highest among other significant symptoms. It is suggested that there is an association between respiratory symptom occurrence in primary school children and the location of the primary school they attend. The finding demonstrated that the primary school children from heavy traffic areas have shown a higher prevalence of respiratory symptoms compared to primary school children from low traffic area. According to Chen et al. (2015), the adverse respiratory health impact experienced by children who live in urban areas may be attributed to their exposure to an assortment of air pollutants produced by mobile sources. The finding of this study was consistent with the findings from other local studies (Anis et al., 2015; Choo et al., 2015; Wesley and Jalaludin, 2015; Yahaya et al., 2014; Nazariah et al., 2013) whereby the prevalence of respiratory health symptoms was higher among children in the urban area as compared to the suburban or rural area. Another significant finding from this study was there were significant association between PM2.5 and PM10 with lower lung function among children in urban area. The result of present study was in agreement with the local study by Choo et al. (2015) and Azwani et al. (2014) conducted in Petaling Jaya and Balakong respectively, whereby a significant association was found between PM2.5 and PM10 with lower lung function among children in urban area. Another local study by Asrul and Juliana (2017) also stated that PM10 and PM2.5 are significantly associated with lung function abnormality. It is suggested that, the tiny size pollutants can reach deeper inside the children’s lung and interfere with normal function of the lung in gaseous exchange (American Lung Association, 2016). Although very limited study had been done on UFP exposure and lung function of human, this study shows a significant association between the exposures of UFP with lung function abnormalities among the respondents. According to Joshi et al. (2017), UFP is mainly produced by combustion of diesel engines in large number. These particles have higher deposition probability particularly in small airways and the alveolar region of the lungs due to its smaller size which caused reduction of lung function. This study was consistent with a study from Ierodiakonou et al. (2016) showed the concentrations of NO2 and SO2 was all associated with reductions in lung function. However, there is very limited study had been done on airborne CO2 and human respiratory health and the present study shows a significant association between the exposures of CO2 with lung function abnormalities among the respondents. This study suggested that the exposure of particulate matter which is PM10 and PM2.5 is the predictor for reduction of lung function. Gemenetzis et al. (2006) reported that, increase in particulate matter concentration had significant with related lung disorder and with reduction in lung function. Chen et al. (2015) also stated that exposure of PM2.5 caused the reduction of lung function. This study indicated that the exposures to traffic-related air pollutants would increase the risk of getting respiratory symptoms and reduction in lung function among the study respondents. PM10 and PM2.5 was found to be the most significant with the decreased of lung function and respiratory symptoms among the primary school children. It is recommended for primary schools management to relocate the drop by and waiting site for parents away from the school compound. The location of school in heavy traffic should be considered before the decision of development of school is implemented. Vegetation also may help in reducing the concentration of traffic-related air pollutants by considering the use of multiple vegetation type such as combination of bushes and trees. It is recommended for school to implement anti-idling and idle reduction policies at school. Deepest appreciation to Universiti Putra Malaysia for supporting this study with grant under High Impact Putra Grant (Project Code: UPM/800-3/3/1/GPB/2018/9659700). The author would like to thank school staff, parents and their children for their cooperation during data collection process and voluntarily participated in the study. American Lung Association, (2016), Air Pollutants, Retrieved April 30, 2016, from: http://www.lung.org/. Anis, S.K., Juliana, J., Chua, P.C., (2015), Indoor Air Quality and its Association with respiratory health among Malay preschool children in Shah Alam and Hulu Langat, Selangor, Advances in Environmental Biology, 9(9), p17-26. Asrul, S., Juliana, J., (2017), Indoor air quality and its association with respiratory health among preschool children in urban and suburban, Malaysian Journal of Public Health Medicine (Special Issues), p78-88. Azwani, M.N.R., Juliana, J., Chua, P.C., (2014), Indoor air quality and respiratory health effects among malay preschool children in Selangor, Proceeding of 1st International Conference on Environmental and Occupational Health. Fadzil, N.A.S., Jalaludin, J., (2013), Indoor particulate matter 2.5 (PM2.5) and lung function among children living near busy road in Cheras, Kuala Lumpur, Health and the Environment Journal, 4(2), p1-19. Joshi, A.R., Vaidya, S.M., Pimpale, N., (2017), Study of ventilatory lung function tests of bus drivers in Pune City, International Journal of Basic & Applied Physiology, 6(1), p97. Ministry of Transport Malaysia, (2017), Statistik Pengangkutan Malaysia 2016, Retrieved on 15th October 2017 from http://www.mot.gov.my/my/Statistik%20Tahunan%20Pengangkutan/Statistik%20Pengangkutan%20Malaysia%202016.pdf. Rawi, M.N., Azwani, N., Jalaludin, J., Chua, P.C., (2015), Indoor air quality and respiratory health among Malay preschool children in Selangor, BioMed Research International. Road Traffic Volume Malaysia, (2014), Ministry of Works Malaysia, Highway Planning Division, (2015), Kuala Lumpur: Ministry of Works. N=16 aT-test , bMann-Whitney U Test *Significant at p<0.05.